This pilot gives a rare snapshot into lives after a mass shooting. Told by the survivors of Columbine and the Batman Theater Shooting in Aurora, Colorado, on July 20, 2012. Written, Directed and Acted in by Aurora survivor Tim McGrath. Lucky's Clinic is a hilarious comedy that follows the life of Cancel Hospital Director, Lucky, after he finds out he has ball cancer. Created by Tim McGrath. From the Director & Producer of "10 Things I Hate About You"
Tim McGrath is the writer, director and actor in Surviving Theater 9. The film is based on the true stories of the midnight screening of Batman in Aurora, Colorado on July 20, 2012. Tim went to the midnight screening, when a gunman opened fire in the theater, which became the largest mass shooting in U.S. history at the time, surpassed then by Orlando and Las Vegas. Tim started law school at USC one month after the shooting, and began to experience strong symptoms of PTSD. He had trouble finding a help, until he met Kim, a woman who had been a Columbine survivor. Kim was offering help to those affected by the Batman shooting. Tim joined Kim and a group of other survivors as they navigated their way through the aftermath of the shooting. Tim saw an extraordinary true story emerge from the shooting, and decided to tell the story with his fellow survivors from a first hand account, in a way that could not be replicated by the press. "People heal through stories. When I was having problems from the Batman shooting, the solutions that were offered to me were jumping on prescription drugs, and dense psychological reading about what I was going through, or jumping on prescription drugs. I wanted something easier, something that didn't make me feel so alone but was still productive to get me back functioning in the world. 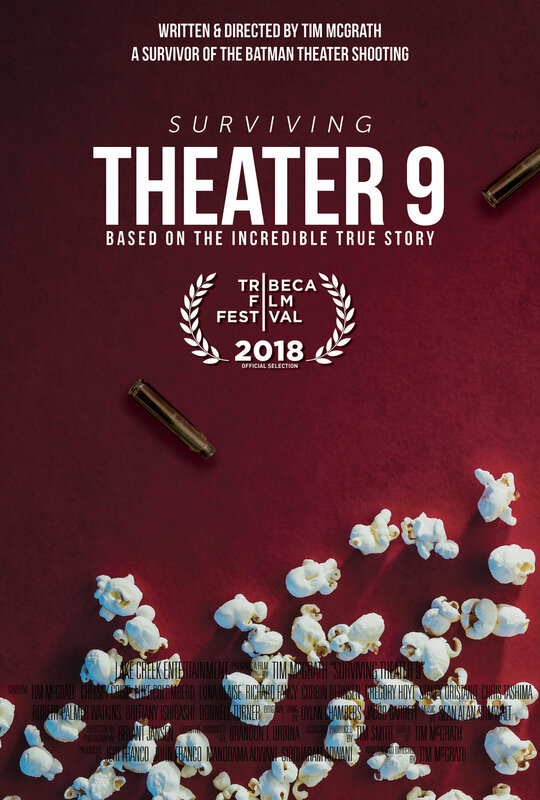 The intention for Theater 9 is having a film that shows what people do with what life hands them makes all the difference. And give a path for anyone going through a tough time. The film does not show the shooter, and is non-partisan about gun control. There is plenty of comment on those topics. This is something we haven't seen." Tim McGrath is an award-winning screenwriter, director and actor. He wrote and is attached to the upcoming '10 Things I Hate About Love', a follow up from the director and producer of 10 Things I Hate About You, starring Heath Ledge and Julia Styles. Tim also wrote and directed the award-winning comedy television pilot called 'Lucky's Clinic.' Tim currently lives in California before moving to Nashville soon. He likes country music, hiking in the Colorado mountains with his family, and chipotle. Tim McGrath started the Surviving Theater 9 Foundation. Shooting survivors need help. The foundation is for anyone who wants to donate to help support survivors. Survivors need help with medical bills, therapy bills, basic living expenses: some cannot work due to their physical injuries or mental health issues. "DIARY OF A MASS SHOOTING" is a book written by Tim McGrath where he goes into great detail about his experience after surviving the shooting in Aurora, Colorado. He discusses the teachings he was taught during this difficult time that helped him push through. He is sharing what he's learned and techniques he's developed in hopes to help others. Sign up for email updates below to be notified when the book is available for purchase.